Did you participate in SRATS CONGRESS 2016 ? If so, your user account is still active for SRATS CONGRESS 2018. 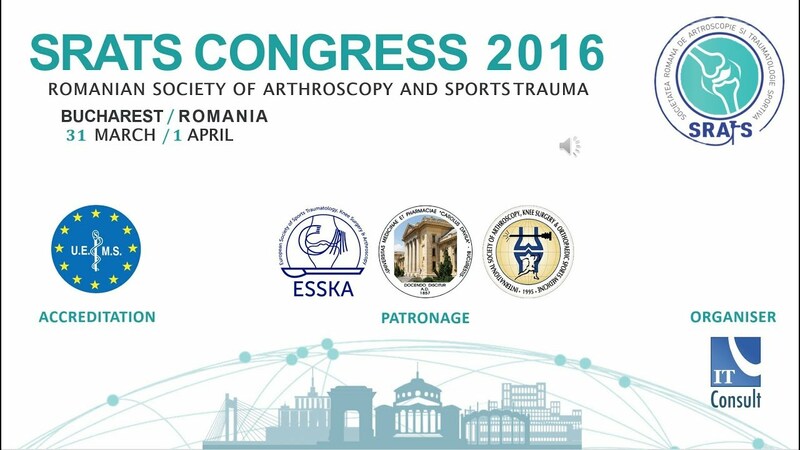 SRATS Congress 2016 was the first Congress organized by the Romanian Society of Arthroscopy and Sports Trauma. This successful event, as demonstrated by the quality of the Scientific Program and also by the large number of delegates, motivated us to continue the work we started two years ago. The upcoming SRATS Congress 2018 held between 21-23 March in Bucharest is meant to bring new insights into the continuously evolving area of arthroscopic surgery. The participation of a higher number of top rated international invited speakers, improved three days scientific program structured in Highlight Lectures, Instructional Courses, Symposia, Debates, Roundtables, Free Papers, E-Posters, Lunch Workshops, Physiotherapy and Anesthesiology Symposia, the publication of the abstracts of the congress' presentations in a Thomson-Reuters indexed Scientific Proceedings Journal and a larger and modern congress venue are all important reasons to hope for an even better scientific event. The scientific program will address mainly topics of interest related to the knee and shoulder pathology. During the numerous Symposia, the reconstruction of the cruciate ligaments, the pathology of the extra-articular knee ligaments, meniscal and cartilage pathology, gleno-humeral instability and rotator cuff injury will be thoroughly debated. However, improved and longer Symposia focused on hip and ankle arthroscopy will be included in the scientific program of SRATS Congress 2018. Moreover, topics from cross-specialties area will be debated during the Physiotherapy and Anesthesiology Symposia. Nevertheless, Oral Presentations sessions will be an important part of the scientific program and we kindly invite you send your work focused on arthroscopic surgery. We propose a motivating Scientific Program supported by international faculty as well as by the most important personalities in the arthroscopic surgery in our country. We hope for an interactive meeting, with challenging debates between the faculty and the audience. The city is rapidly gaining attention as a competitive city break that blends the wonders of modern Europe with the far flung exotism of the East. For some of us, Bucharest is just the city where you can see Ceausescu’s Palace (People”s Palace- Palace of Parliament), for others it will always remain "The Little Paris" of the East. In fact, Little Paris is considered to be also an era in the history of Bucharest and traces of them can still be admired today in the architecture of palaces, public buildings and hotels.